Species from cats to monkeys and protozoa to plants can borrow a jellyfish’s luminescence to help trace the spread of disease. Tagging and tracking disease – visualizing the insidious spread of Alzheimer’s or a metastasizing cancer, or tracing how a pathogen moves – is possible today thanks to the harnessing of a 160-million-year-old protein responsible for a jellyfish’s green glow. Aequorea, a jellyfish species that lives off America’s Northwest Coast that reaches up to ten centimeters in diameter, are virtually colorless. But a luminescent protein they produce lights up the rim of their bell, giving them the appearance of a string of tiny glimmering green bulbs bobbing among the waves. Though in actuality the light emitted is bluish due to a molecule known as aequorin, light reflecting off a green protein paired with it makes the glimmer appear green to the naked eye. The protein’s molecule – now known in medical research circles as GFP (green fluorescent protein) – offers researchers the capacity to see formerly invisible cells in Technicolor. Its isolation, cloning and application won three researchers – Osamu Shimomura, Martin Chalfie, and Roger Y. Tsien – the Nobel Prize in Chemistry in 2008. It also changed the game in terms of disease tagging and tracking. What makes GFP so useful is that its DNA can be cloned and fused to the cells of other living organisms without any negative effects. And since the energy for the light is generated by a chemical reaction in the cells, they can generate their own glow. When the cells multiply, the GFPs multiply too, carrying forward the ability to light the way, as it were. 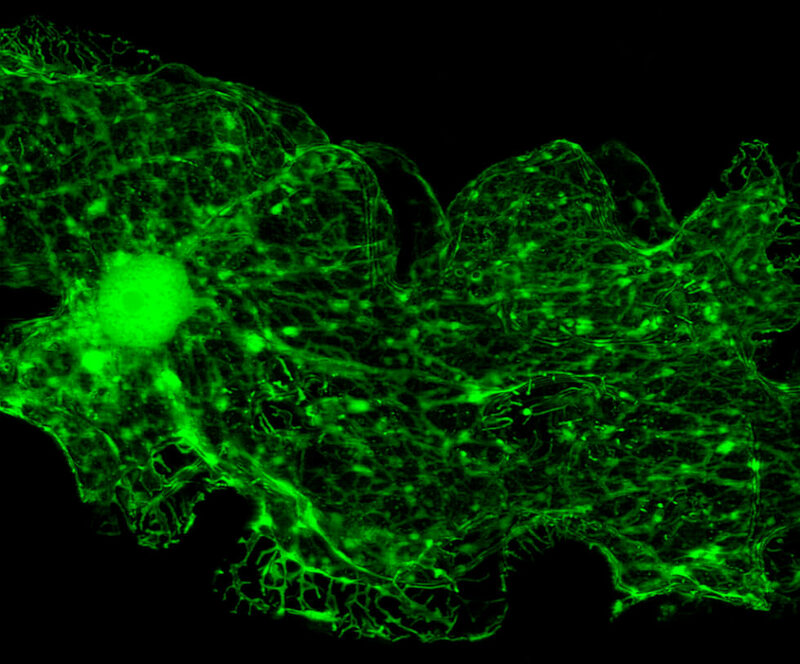 By attaching GFP to an antibody – the molecules produced by the body's immune system to fight diseases and other foreign invaders – for example, it can be used to diagnose disease by tracking the disease-fighters’ path. Recent GFP disease-tracing successes include monitoring the spread of the gene associated with feline AIDS, a disease that parallels its human counterpart. By attaching GFP to the end of the gene, scientists at the Mayo Clinic began to monitor the cats’ bodies’ response to the disease. The result looks like an Internet meme, but the glowing green kittens provided powerful information to help combat the disease. Elsewhere, tacking GFP onto an RNA sequence in chicks is helping identify the transmittal of avian flu; in mosquitos, dengue fever and malaria. Twentieth century scientists weren’t the first to observe bioluminescence – in January 1832, Charles Darwin wrote of the “sparks” he witnessed off the coast of Tenerife – but they were the first to harness its power. Osamu Shimomura was the first person to isolate GFP and discover exactly which part of the protein was responsible for its glow. In 1988, Martin Chalfie became the first to successfully make another organism fluoresce with the borrowed light. Roger Y. Tsien chimed in by developing mutant proteins that fluoresced faster and brighter and produced a spectrum of colors. Their collective bright idea caught on and flourished in labs worldwide in the decades since. Today, according to Marc Zimmer’s book Illuminating Disease, bioluminescent proteins are used in some one million experiments every year.